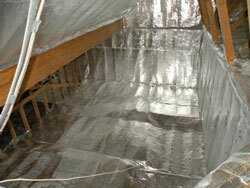 eShield™ Multi-Layer Reflective Insulation – This foil type of insulation has a center core of high-density fiberglass. It’s designed to work with, not replace, your existing insulation in order to give your home superior energy efficiency. eShield™ Super Green Eco Insulation – This blown-in fiberglass insulation is made from 100 percent recycled content, is naturally fire-resistant, and provides optimal energy-efficiency benefits. Working together, these specific types of insulation not only block conductive and convective heat transfer, but also block radiant heat transfer as well. For more information on the types of attic insulation and reflective house painting (texture coating) offered by Green Machine and how they can help you to reduce your monthly utility bill, please contact us today. We are insulation contractors proudly serving homeowners in Atlantic Beach, Amelia Island, Orange Park, Jacksonville Beach, Vilano Beach, Palm Coast, Mandarin, and beyond.